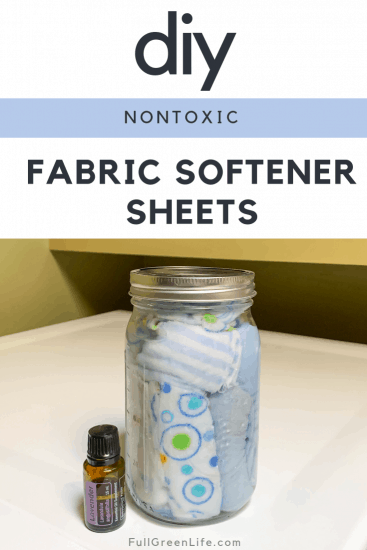 I recently started using homemade fabric softener sheets and it’s such a great discovery, I have to share! I’ve been cutting toxins from our home for years, and store-bought fabric softener is definitely not worth the risk. (More about that in a minute.) So this whole time, my family has just gone without fabric softener. In my mind, the main purpose for fabric softener is to make clothes smell nice, and that’s not really a priority for me. Back in the day when I heard Martha Stewart say that “clean” doesn’t have a smell, the idea stuck. If it’s clean, it smells like nothing! Common fabric softeners, both liquid and dryer sheets, contain numerous chemicals to create the fragrance and the softening effect on your laundry. The types of chemicals used and their potential effects are listed below. Source: ewg.org. Fragrances Many different synthetic caremicals is used to create the fragrance that is deposited onto your clothes. Side effects of these chemicals can include skin irritation/allergy, toxicity to the aquatic environment, and negative effects on the nervous and respiratory systems. Fabric Softening Agents There are many different chemicals included in fabric softeners for this purpose. Effects of these chemicals can include triggering asthma, skin irritation and allergies, and reproductive harm. Preservatives & Colors Effects of the chemicals used for this purpose include skin allergy, asthma trigger, and toxicity to marine life. Anyone raising kids today is likely concerned with the safety of products used in and around the home. I especially try to be careful about the substances that come in direct contact with my family, and fabric softener definitely falls in that category since it coats the clothes that we wear every day. My kids all have a different mix of allergies, asthma, and skin sensitivities, like a lot of other families, so commercial fabric softener is simply a no-go. Like most things used for cleaning around the house, if you want to be 100% certain its safe and nontoxic, DIY is the answer! Like I mentioned, I had not been using any fabric softener at all for my family’s laundry. One big problem we were having though, was static. I do often use white vinegar in the softener compartment of my washing machine, and this DOES work miracles for getting clothes smelling fresh. However, it never helped with the static. I thought I’d give making my own non-toxic dryer sheets a go to see if it would help. Making the actual dryer sheets is super easy. It’s actually a great opportunity to repurpose other items in your house. For my dryer sheets, I use those little, thin terry washcloths that we all buy when we have a newborn. After 5 kids, I had a bunch of them stashed. Here are some other ideas of what you can use. The dryer sheets shouldn’t be very big. Around 5-7″ square is a good size. 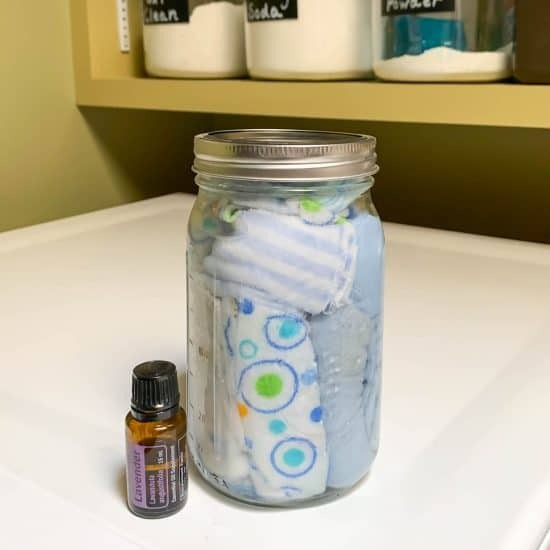 Step 1: Put as many of your dry dryer sheets into your jar as you can. I rolled mine up the first time but just stuffed them in there after that. Step 2: In a separate container, mix together 1 1/2 cups of white vinegar, 1/2 cup of distilled water (or water that you’ve boiled), and 20 drops of your favorite essential oil. I like to use, lavender, lemon/orange, or tea tree. Step 3: Pour the solution over your dryer sheets in the jar and put the lid on. It may take a little while for all of the sheets to absorb the solution. Step 4: When you switch a load of laundry into the dryer, toss in one of your dryer sheets. The vinegar smell goes away after the clothes have dried, but you will be able to smell the essential oil on your laundry. And your clothes will be SO soft and static-free!! I wish I hadn’t waited so long to try out this green DIY because it’s a good one! Let me know what you think when you try it! For my other favorite uses of vinegar around the house, check out 5 Effective Uses of Vinegar for Non-Toxic Cleaning.